As the hot temperatures of the summer season subside and you get back into a routine of taking your kids to school or heading to practices and games each week, there are a few tips to get your vehicle ready for another season. One of the first things that you should do is make sure you have antifreeze in your radiator and reservoir. Antifreeze will help to keep your radiator lines from freezing when it gets colder in the fall and winter. The fall season often brings more rain and even some snow to areas of the country. Before getting out on the road, you need to ensure that your brakes are maintained as well as your tires. 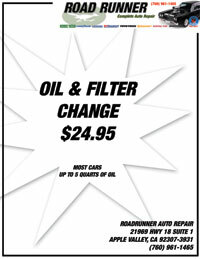 Road Runner Auto Care in Apple Valley can examine your brake pads and the rotors to make sure you can get stopped on the road in any driving conditions. The mechanics at Road Runner Auto Care can check your tire pressure and properly inflate your tires for cooler weather. Since the days are shorter in the fall, you want to check your headlights and taillights to see that they work properly. You also need to check your hazard lights to see that they come on in case you’re in an emergency. Technicians at Road Runner Auto Care in Apple Valley can replace the bulbs with halogen lamps that are brighter, which will allow you to see farther on the road while you’re driving. Wiper blades should be examined or replaced if needed due to more fog in the fall season and the arrival of winter weather. Check the defroster as well as your heater because you don’t want to spend several minutes scraping ice off your windshield each morning or waiting several minutes for your vehicle to get warm when you need to go to work or take your kids to school.